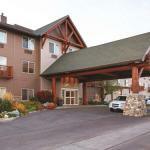 Boasting a scenic river location rooms with free internet access and an indoor pool and hot tub La Quinta Inn & Suites Great Falls has your key to a comfortable stay in Big Sky Country. The three-story hotel provides 92 rooms with free internet access coffeemakers and hairdryers. You'll have a microwave to heat leftovers and quick-serve meals and flat-panel TVs with premium cable to enjoy while you unwind from your day. For serious relaxation consider a soak in the hot tub located beside the heated indoor pool. Come morning the complimentary breakfast buffet featuring items like waffles and a variety of hot and cold cereals will give you energy to get up and go. Additional amenities include fitness and business centers. The hotel offers complimentary airport shuttle service available Monday through Saturday from 6 a.m. to 3 p.m. and Sunday through Thursday from 7 p.m. to midnight. Pets are welcome for an additional fee. The hotel is located on the banks of the Missouri offering opportunities for walking or biking along the River's Edge Trail. It's two miles to the C.M. Russell Museum and Holiday Village Mall featuring over 80 retailers. The Lewis & Clark Interpretive Center and the Great Falls International Airport are five miles from La Quinta. It's six miles to Malmstrom Air Force Base. Dogs of all sizes are allowed. There are no additional pet fees. There is a pet waiver to sign at check in. Dogs may not be left unattended, and they must be leashed and cleaned up after.